Do you remember any of that happening ?… I don’t. 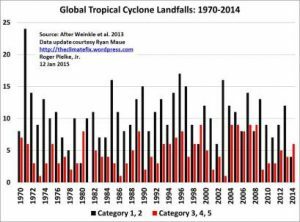 So, how long is it since a major hurricane (defined as a Category 3 or above) made landfall in USA? “Cyclones & hurricanes will be more powerful & frequent” – Kerry Emanuel MIT, 1987. Less powerful & lightly less frequent !